“One is a story about a leader becoming a dictator and getting overthrown, leaving a basket-case country in a basket-case condition. The second is the story of a popular movement being thwarted in its struggle for democracy and development and ending with a new dictatorship imposed upon it,” writes Podur, Associate Professor in environmental studies at Toronto’s York University, in his new book, Haiti’s New Dictatorship: The Coup, the Earthquake and the UN Occupation (Pluto Press). 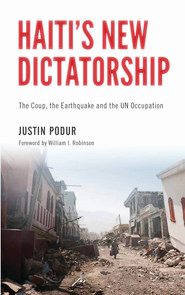 Podur shows the total subordination and outsourcing of a nation’s sovereignty to a decentralized, multilateral, unaccountable network of foreign governments, international financial institutions, aid organizations, transnational investors, and the United Nations, all working in concert with local elites to rob Haiti of its hard-won independence and democracy. Starting with a brief history of Haiti’s successful slave rebellion and founding as the first modern black republic in 1804, Podur recounts the 1915-34 U.S. Marine occupation, the Duvalier dynasty’s dictatorship, and the rise of the popular democratic movement that toppled Jean-Claude “Baby Doc” Duvalier, eventually sweeping Aristide to power. But the book centers mainly on the 2004 coup d’état and its aftermath through to the 2010 earthquake, cholera epidemic, and illegitimate, deeply flawed elections that brought the current government of President Michel Martelly to power. Podur’s book emerges from several years of collecting files on Haiti and wanting to build on Peter Hallward’s indispensable Damming the Flood: Haiti, Aristide and the Politics of Containment (Verso, 2007). For readers who have closely followed Haiti news post-coup, Podur’s book sometimes may seem wanting in original research, reading like a compilation of news and reports. But what it lacks in on-the-ground insight is made up for in spot-on analysis, which will intrigue people interested in Haiti and the geopolitics of contemporary imperialism. Moreover, Podur’s critique helps show how western democracy has been rendered so feckless in a world where globalization is dismantling public state structures and protections to better facilitate flows of private transnational capital. The human and environmental damage inflicted by this new dictatorship is more evident in Haiti, but the country is merely an indicative microcosm of what privatization and deregulation are wreaking everywhere in the capitalist world. Podur shows that the language of human rights, sustainable development, and humanitarian aid is used to cloak Haiti’s ever greater penetration by and subordination to transnational capital. According to him, those who supported the overthrow of Aristide – namely the tiny clique that owns and enjoys the majority of Haiti’s property and privileges, as well as the U.S., Canada, France and their respective military, diplomatic and media corps, using the “old trick” of branding the coup victim a human-rights-violating dictator – should not also get to write the history of what happened. “Where old dictators muzzled the press, the new dictatorship outcompetes its opponents in propaganda,” writes Podur detailing how the media was an integral “part of the coup infrastructure,” framing international opinion to approve of the overthrow of Aristide at the time. Documenting how the post-coup government was quantitatively worse than Aristide’s, Podur tallies up in meticulous and gruesome detail the body count of thousands and the human rights aberrations carried out by the U.S.-backed regime of de facto Prime Minister Gérard Latortue, whose death squads purged the capital’s poorest neighborhoods in a campaign to demobilize and neutralize the popular democratic Lavalas movement that had twice carried Aristide to power. The reader sees clearly how the “responsibility to protect” – or R2P in foreign policy lingo – provided the excuse for a military intervention in 2004, replacing a democratically elected president with a quantifiably worse military regime. Summary executions, disappearances, political prisoners, and rigged elections all took place under the watch of MINUSTAH, the United Nations “peacekeeping” force brought in to replace the U.S., French and Canadian troops that first arrived in Haiti after Aristide was victim of what Podur aptly calls “a geo-political kidnapping.” MINUSTAH not only provided cover for the post-coup death squads, knowingly incorporated paramilitary putschists into the police ranks, and systematically ignored any human rights monitoring, the blue helmets even opened fire on civilians in Haiti’s popular neighborhoods, effectively consolidating the coup by acting as an outsourced military force in a country without an army of its own. The cholera epidemic, now the worst in the world with a death toll around 7,600 since Nepalese UN troops inadvertently introduced it into Haiti in October 2010, is a case in point: despite half a dozen studies, including the UN’s, pointing directly to the UN latrines as the source and cause of the epidemic, the UN has refused to take any responsibility, let alone apologize for its gross negligence. Hence, The New Dictatorship is an important addition to the many books on Haiti coming out around the earthquake’s third anniversary. Podur clearly exposes the atrophying effect big foreign NGOs have had on the Haitian state’s ability to function. Despite the generous and genuine international outpouring of solidarity after the quake, Podur reveals the utter lack of accountability that the new dictatorship’s myriad of institutions, both large and small, have toward their supposed beneficiaries. Isabeau Doucet is a freelance reporter, TV producer, writer, and video journalist who?spent a year in Haiti after the 2010 earthquake?investigating stories for Al Jazeera English, the Guardian, the Nation, and Haiti Liberté, among others.